An interesting note on Barbuda, given the general consensus that ocean levels are rising and the sheer existence of many islands (amongst other things) is threatened by this, is the fact that allegedly this is one island that used to be underwater but apparently came up for air. In fact, all around there are signs of this. The main topography of the land is coral limestone with very little variation throughout, and if you look closely as you walk along the natural footpaths you will notice that you are actually walking on ancient bits of brain coral and the like. This island is a bit of an anomaly amongst it's neighboring volcanic cloud-dwellers in that it is very low lying with hardly any contour at all. Sailing the thirty miles from Antigua to get here, you can hardly get a sight on it until you get five to seven miles away which is definitely unusual for these parts. I mentioned before that it's a bit off the beaten path, and this combined with the fact that we are currently traveling during "low" season, meant that we seemed to have the island all to ourselves. We explored the windward side of Gravenor Bay, hiking around the dramatic Spanish Point and checking out all the treasures in the tide pools. We took an island tour (at at ridiculously embarrassing price - yes, even after haggling - with a tour guide who I can only describe as "uninspiring") to small the village of Codrington and then hiked inside some nearby caves where we learned a bit about some medicinal plants and local flora and fauna, and were treated to some fantastic views from the islands "highlands". We anchored for a day along eleven mile beach, home of the famous pink sand, and strolled along seeing nary a soul on the whole stretch - once again punctuating the fact that it seemed we had this place all to ourselves. If you want to know more about the amenities, activities and services offered on this beautiful, sleepy island, check out the BARBUDAFUL site run by the lovely Claire of the ArtCafe. 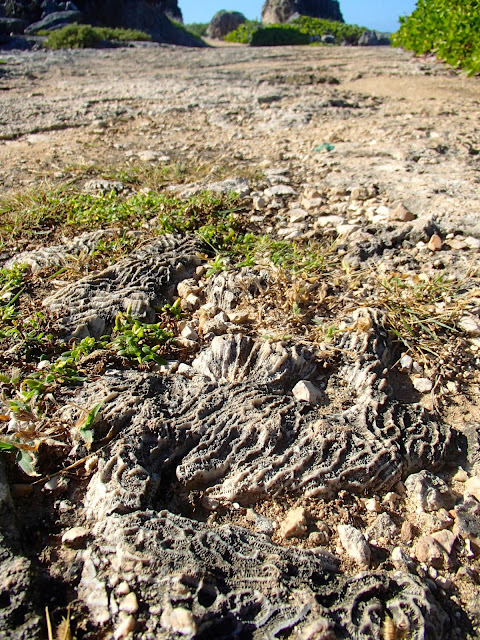 Ancient coral is all underfoot on Barbuda. Beautiful beaches and a harsh, reefy shoreline made this island a menace to ships in the 1700's. Family photo in a cave. A view from the "highlands"
24 weeks pregnant with twins and spelunking! They play a local game called Wari (same as Mancala) with the seeds of this plant. ...so naturally we took one as a souveneir. We found a dead blue crab while exploring a nearby salt pond. (Isla is REALLY into crabs at the moment). We had the entire Gravenor bay all to ourselves. 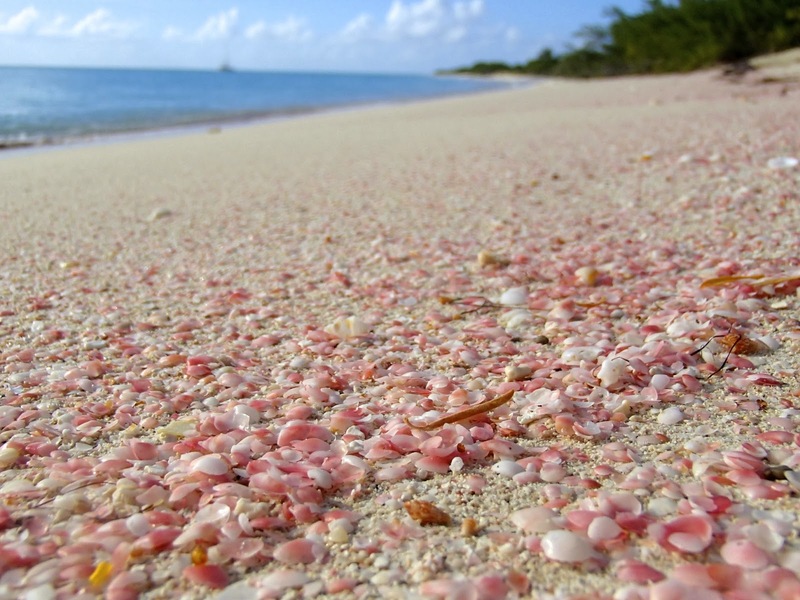 Beautiful pink sand lined all of eleven mile beach. Air Isla! This child is a bit of an adrenaline junkie. We were there a few years ago. It is tricky getting in there but it is well worth it. We had the whole beach to ourselves. This is really beautiful place to enjoy as I remember my college days when Travel with friends always nice to such places, but now things are changed as a married life the same is enjoys with family trip as recently I visited Tanzania a beautiful African place.